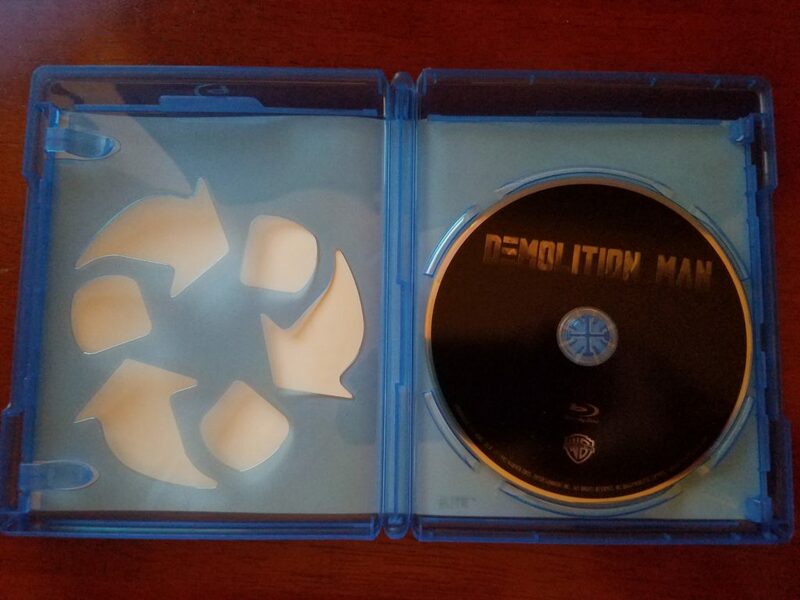 Demolition Man -Blu-Ray Review - ReDVDit! If you are like me then at one point or another you have wondered just how the three seashells work. If you have indeed spent hours of your life wasting away in thought over this conundrum then undoubtedly you are familiar with the film Demolition Man. It is in every way a 90’s action flick. It has the four must-have elements of a great and memorable action film, the badass lead (Sylvester Stallone), the love interest (Sandra Bullock), the big baddie (Wesley Snipes), and the outlandish plot (being frozen in thawed out years later). As an added bonus we also end with weird Rob Schneider tertiary character (my favorite nineties random occurrence, also happened in Judge Dredd). 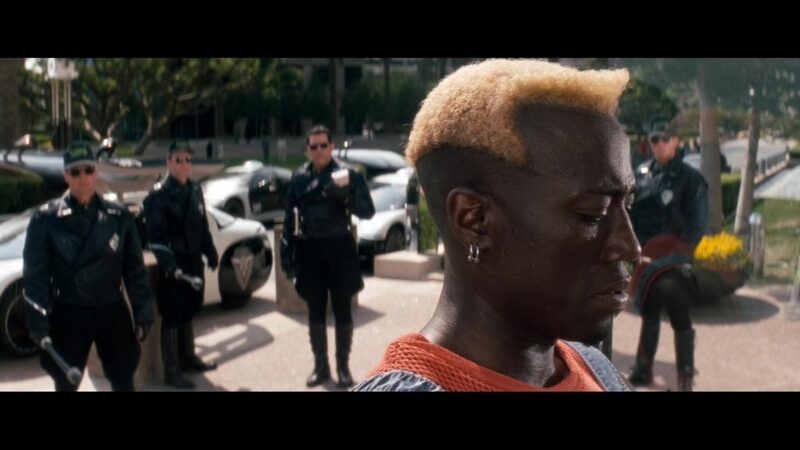 Demolition Man is just one of those films that if you did not see it when it was meant to be seen, and by that I mean a hundred times in the nineties, then it will not work for you now. The film doesn’t necessarily hold up all that well against the years that have gone by. There are some definitive moments that simply don’t make sense in the grand scheme of things. I will say something that will stick with me forever, is the opening sequence. As an adult, I really didn’t realize how awkward the, what seems like five minute long, slow pan over Sylvester Stallone’s naked body is. Also, the seemingly innocent look at our potential future is actually quite dark when it is broken down and makes me feel that as a whole the director and writers had a rather bleak outlook on what the future holds. However, then again, how much do I really want to dissect Demolition Man? Our film takes advantage of the time hopping trend of the nineties and takes it one step further, by following two men destined by fate to be enemies. Simon Phoenix (Wesley Snipes) is THE criminal, and the man that is set to hunt him down is super cop John Spartan (Sylvester Stallone). In a rather gruesome act of violence, both men are given the same judgment and are frozen in suspended animation prison for their actions. As most things do something goes terribly wrong, and Phoenix gets set loose and the police of the future in an act of desperation turn to John Spartan for help as they are ill-equipped to handle any violence at all. The plot works but only sort of, the assumption in the nineties seemed to be anything was a go as long as you have the right star and proper action to back the plot. 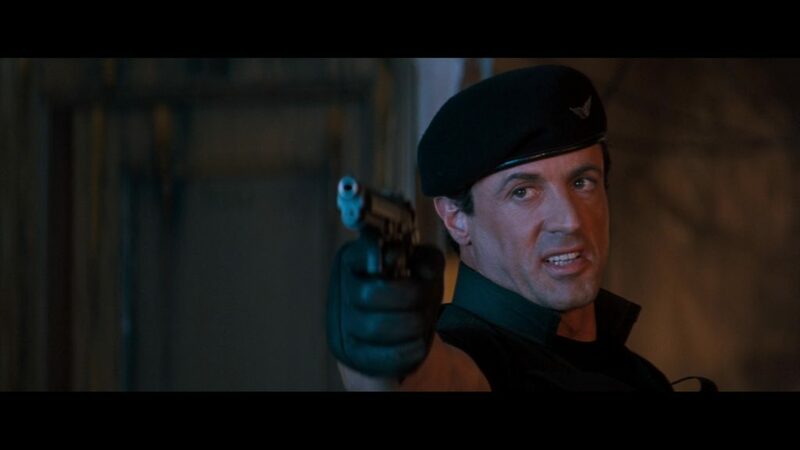 Let’s be honest, this goes for most of Stallone’s work in the nineties. What really drives this film home for me is the way Snipes and Stallone seem like perfect enemies in this film. With the right villain, any film can go far. What does not carry for me as an adult is the beginning, the uncomfortably repetitious camera panning over Stallone is unnecessary and just plain weird. Almost seems like an odd demand from an aspiring action star to show how muscular he is compared to I don’t know Arnold Schwarzenegger. The quality is definitely night and day. I wish I had a side by side of VHS vs DVD vs Blu-ray but the difference is just phenomenal. The detail on the uniforms is there, the action and effects lose luster because of how good the definition is, however, it all seems worth it to experience the nostalgia of my youth for 115 minutes. I have been waiting to buy this one for some time however it seems overly hard to find and I hyped it up in my head for this exact reason. The good news here is that it truly looks like a nearly different film because of how detailed everything is. Academy Award-winning composer Elliot Goldenthal took his hand at Demolition Man. What most likely did not seem like a bad idea at the time now looks an oddity on an otherwise consistent and impressive IMDb page for Goldenthal. The score works, and in all honesty, for a film like this should be an easy paycheck for someone like Goldenthal. That being said, the film does have dramatic moments and acting..efforts. And in that regard, the score does what it can to add to the drama. As far as the home release audio quality goes, the film is a risk plain and simple it was films like this that got my Dad and I noise complaints time and time again because we wanted loud explosions and short dialogue scenes. It didn’t really matter if the levels were consistent so everything usually just stayed at eleven(really loud). The good news is that this time around everything seems in order. The levels are consistent and unobtrusive. No adjusting and re-adjusting, no subtitles, just turn it on sit back and try to remember it the way it was when you first saw it. So the packaging has always felt on point for this one for me. For one, the names are in the right spot, the taglines are corny and suit the film consistently. The whole thing screams really corny and does not “bring the whole film to a new generation”. The packaging feels cheap for the most part and obviously came without a slipcover. On the inside, we find no code and an all black disc with just the title, which kind of works for me as well. Could the packaging be given some more thought, yes, however, why would it really need it? 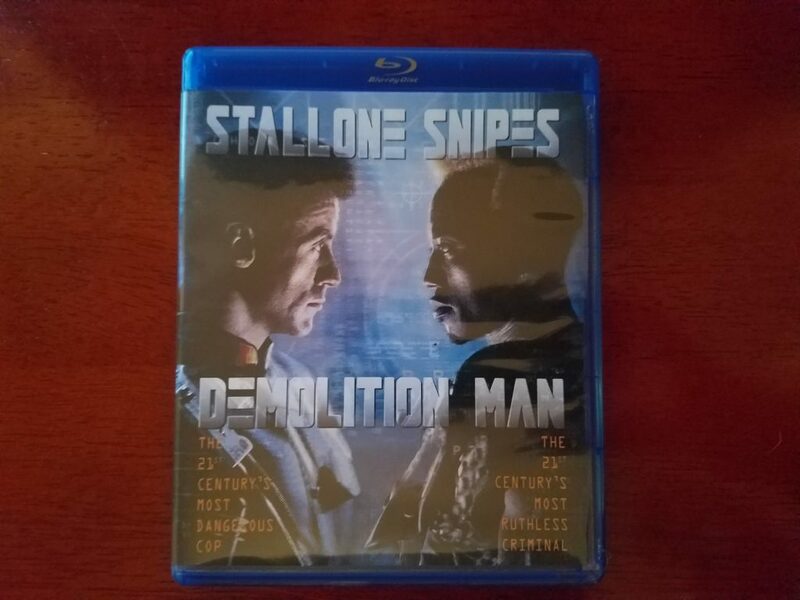 Everyone needs Demolition Man in their collection. 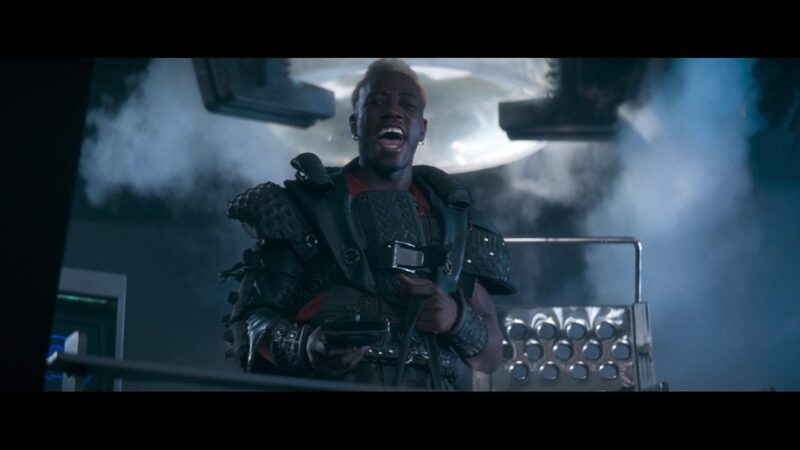 Demolition Man does what most films cannot do these days. Deliver exactly what you expect from it without the worry of overhyping or taking itself too seriously. Demolition Man is listed as a better than average action movie with subtle tones of humor. I find that the older I get the more humor there is and no I am not referring to Dennis Leary’s performance. The film finds itself in the sweet spot of not being as good as The Last Action Hero and being solidly better than Judge Dredd. Is this the greatest movies of the nineties? Perhaps not but it is still a good time for those who enjoyed it as a kid. You can purchase this edition HERE.